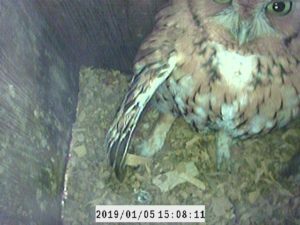 March 28, 2019 we went to the Metzger Tract by Watermelon Pond (where the burrowing owls are) and found and photographed two boxes being used by kestrels, one with a male kestrel incubating eggs and the other with four eggs. On last Tuesday, we went to the other side of Watermelon Pond on the Division of Forestry land and found four boxes occupied with screech owls incubating eggs. 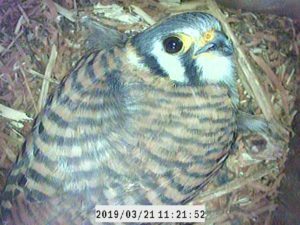 The week before, we found eight boxes with kestrel eggs, most being incubated by female kestrels. We still have more boxes to check, but it looks pretty good so far, and we are learning some interesting things For instance, two boxes on utility poles in plain sight of each other and only perhaps 150 yards apart on the Shay property each had female kestrels in them incubating 5 eggs. 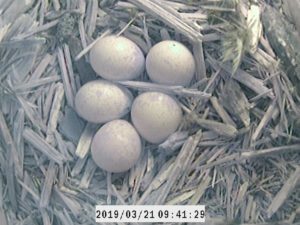 Kestrels arn’t supposed to nest that close together. 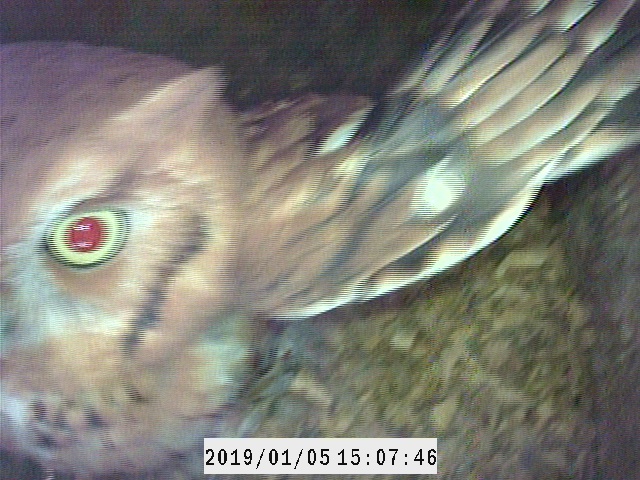 Attached are some of the photos we have been taking with our new pole camera. 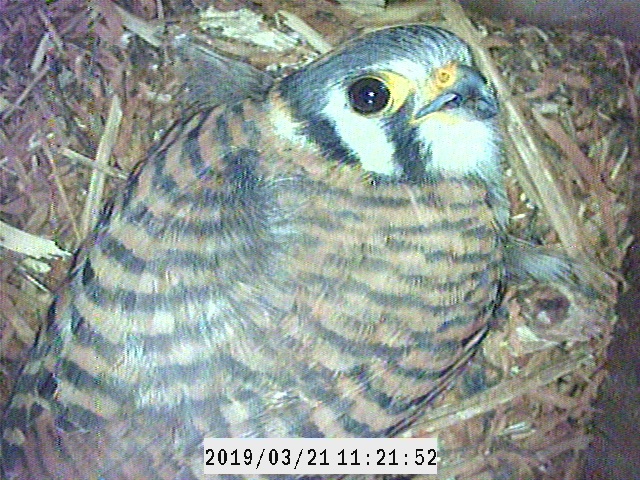 Female American Kestrel incubating eggs. 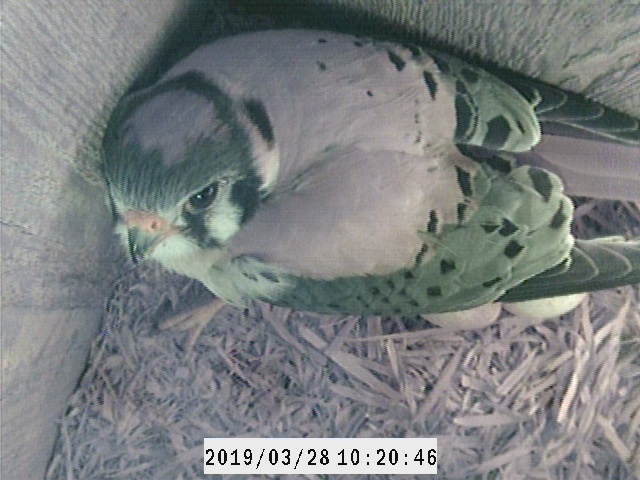 Male American Kestrel incubating eggs. 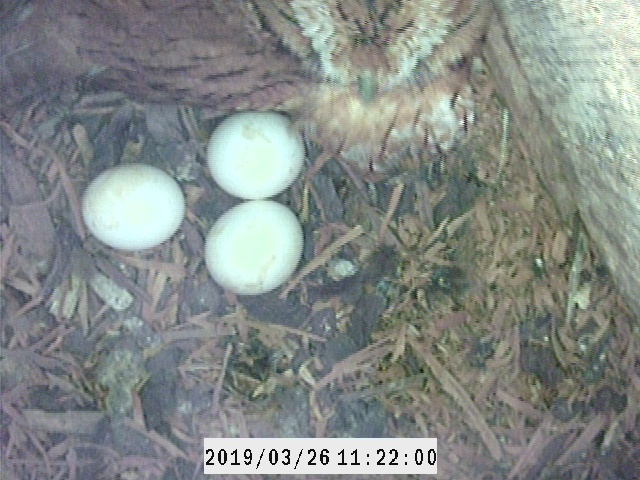 Eastern Screech Owl incubating eggs. Eastern Screech Owl (red phase), often found in nest boxes. The Alachua Audubon Society wishes to recognize the longest-standing member of Alachua County’s birding community. After many decades of leading field trips for AAS, the St. Mark’s field trip in early January will be John Hintermister’s final Audubon-led field trip. 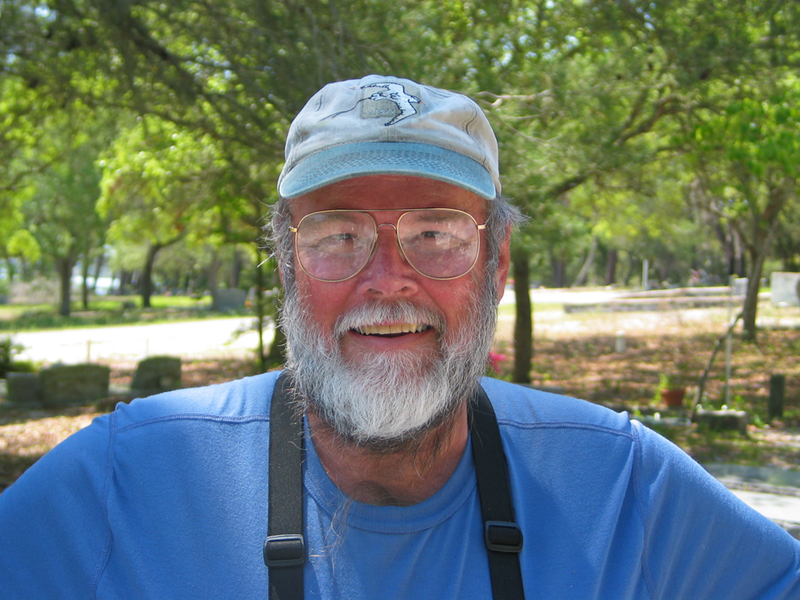 John was a trail-blazer to birding in Alachua County and his contributions to birds, birding, science, and conservation are immense. As a young boy, John was inspired to watch birds when two women would take him on birdwatching excursions. By the time John was 11, he was hooked on birds. John and his brother would pedal their bikes to Lake Alice and by noon, would sometimes list 100 species. When describing this, John said, “Now I don’t know if we identified them all correctly, but we would get 100 species.” They may well have identified them correctly because upon seeing a bird, they would stop and read aloud the entire description from their Peterson field guide. In January of 1960, John attended the inaugural meeting of the AAS. Among its charter members were Oliver Austin, Marjorie Carr, J.C. Dickinson, Jr., and 16-year old John Hintermister. Some of the first year’s field trips included River Styx, Lake Alice, the pinewoods north of the airport where Red-cockaded Woodpeckers nested, Devil’s Millhopper, Paynes Prairie, and San Felasco Hammock. Both Paynes Prairie and San Felasco were still in private ownership. 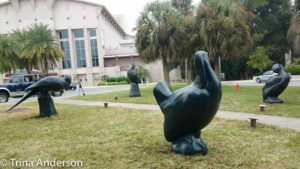 The first Gainesville Christmas Bird Count (CBC) began in 1957, and during its infancy, the CBC had few participants and they birded only from sunup until lunchtime. There were no assigned territories, no team captains, and no organization of any sort. In 1972 at the age of 29, John became the official compiler of the Gainesville CBC. After reading in Peterson’s Book, Birds over Americaabout the methodical way in which the Bronx CBC was conducted, John sought to emulate it for the Gainesville count. He instituted dark-to-dark counts. He cut up a topographic map of the count circle to make territories, appointed team leaders, and assigned them important birds to find in their particular tracts. John served first as compiler of the Gainesville CBC from 1972 – 1981 and then as co-compiler with Howard Adams from 2003 until 2014. During the interim 21-year period from 1981 – 2003, the co-compilers were Craig Parenteau and Barbara Muschiltz. In the mid-70’s John began teaching birding classes through SFCC. There is no telling how many people John inspired through these birding classes, but we know that Mike Manetz and is one. 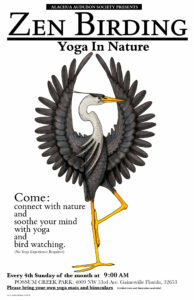 Those SFC birding classes are still taught by AAS and now are led by Charlene Leonard and Cindy Boyd. In 1985, John became the original Alachua County coordinator of Florida’s Breeding Bird Atlas, and it was during this atlas survey that Hooded Warblers were discovered breeding in San Felasco Hammock. He also served as president of AAS and a long-time board member. During his almost 6 decades of involvement with AAS, he has led a countless number of field trips. John once said, “There are birdwatchers and there are people who put their lives on hold in order to bird.” We know which category defines John. If there is one person who has influenced the birding culture in Alachua County more than anyone else, I think we would all agree, it is John Hintermister. AAS is sincerely grateful to John for his dedication to all things birds, his unwavering enthusiasm as he has mentored a generation of birders, and his almost 60 years of devotion to AAS. John has been presented with a life-time membership to AAS. We saw three species that had never before been recorded on the Gainesville Count (Egyptian Goose, Chuck-will’s-widow, and Snail Kite). We set new high counts for 19 (!) species. Though a set of Snail Kite eggs was collected in Micanopy in 1919, there were no additional local sightings until 1996, and only four between 1996 and 2017. 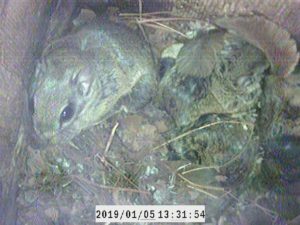 But in 2018 they moved onto Paynes Prairie – they even nested! – and on this year’s Christmas Count, Jonathan Mays counted 29 on the roost at one time! For a bird that had never been recorded on the Gainesville Count, it was a pretty impressive debut! The Limpkin count was even more impressive. Between our first Count in 1957 and the establishment of Sweetwater Wetlands Park, Gainesville’s highest-ever CBC total was 7 in 1987. But Sweetwater and the arrival of exotic apple snails changed everything. Last year’s total was 235, the highest CBC total ever recorded anywhere in the United States. Could we match it this year? We didn’t match it – we smashed it! We more than doubled it, counting 544 Limpkins! 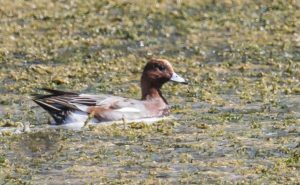 At about lunchtime on October 30th, Rob Norton discovered a drake Eurasian Wigeon at Sweetwater Wetlands Park. He passed the word, and several local birders got to see it before the day was out – including Tom Tompkins, who took the photos below. It hasn’t positively been seen since, though a bird showing one of the field marks was briefly glimpsed the next morning, flying towards Paynes Prairie. As the name implies, Eurasian Wigeons are native to Europe and Asia. Those that stray to eastern North America – a small number every year – are presumed to originate from a breeding population in Iceland. This was only the third in Alachua County’s history. There are stories connected with the other two. The county’s first ever was shot by Dr. A.L. Strange at Orange Lake on December 26, 1931 and mounted by a taxidermist. 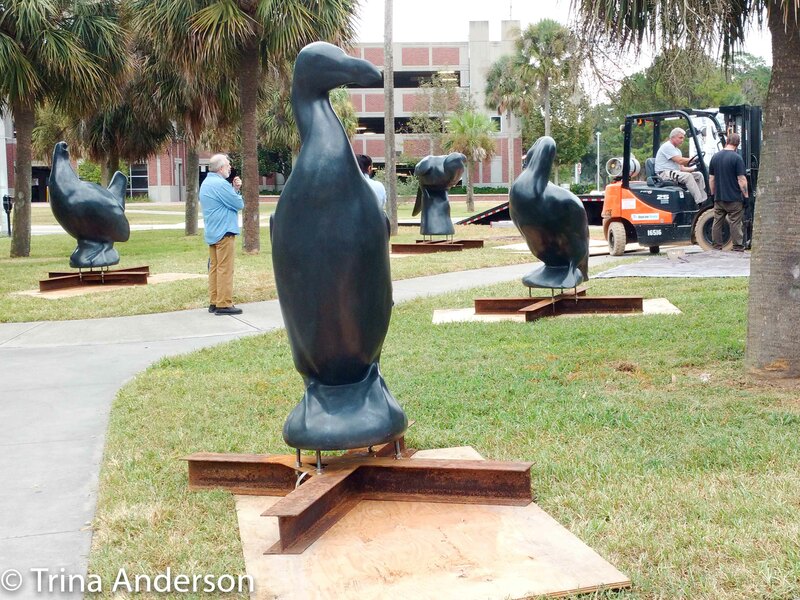 Robert McClanahan, a UF undergraduate compiling an official bird list for the county, tracked down the mount in 1934 – it had lost its head by then – and secured it for the museum. Unfortunately the specimen was discarded in 1962. Leigh Larson found an Egyptian Goose at Sweetwater Wetlands Park this morning. It’s Alachua County’s first-ever sighting of this introduced species, which originally established itself as a resident breeding bird in South Florida and has slowly been expanding its range north. Locally, it was first observed in southern Marion County in 2012 and didn’t move from that area – Summerfield and The Villages – until this May, when four turned up at Tuscawilla Park in northern Ocala. Get out there to Sweetwater if you can and have a look. It’s mainly been in the long channel on the distant side of Cells 1 and 2. While you’re there, keep an eye out for the Caspian Tern, present for its second day now.